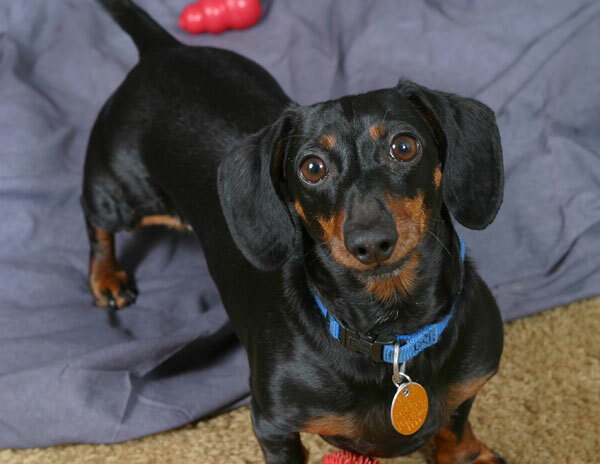 My miniature dachshund Gabby was certainly a dog at heart. She exhibited in great abundance all the good qualities we associate with our canine friends: unconditional love, loyalty and devotion, playfulness, intelligence and inquisitiveness, and many others I do not have the words for. Everyone loved her, and she was the best companion I ever had. But, she was so much more than a dog, as Picasso said of Lump. Gabby and the close bond we developed was far beyond anything I anticipated. It was almost supernatural and as you see in the video above, she really understood me when I talked to her. (Not that she always agreed and did what I said!) Having such an intelligent dog who is also incredibly attached to you could also create complications, as you will see as you read through our story! Gabby lived from November 7, 1997 until June 25, 2015. We met on December 28, 1997 when she was seven weeks old. We had some challenges along the way, but we fought and overcame them together and she had a full, active and happy life until the very end. I designed this site to read like a book, illustrated with pictures, videos and little anecdotes. You can click on individual chapters on the left if they look interesting, or read our story from start to finish by starting at 1 and reading them in order. With this site I hope to amuse and entertain, as well as raise some money for the site’s official charity/cause, The Jake Fund, and help establish similar funds nationwide. As you read you may also find useful tips when you see how I took care of my senior dog and some of the chronic health problems she encountered. Finally, I share my thoughts about pets and the afterlife. Most of all, this is a love letter to my dog that I want to share with the whole world. I want the whole world to know how special she was, and how much I loved her. Thank you for visiting! And though loss is a subject discussed on this site, please read through and be happy, not sad. This is a story of love, happiness and hope. One of my girlfriends once told me, “Gabby is the happiest dog I have ever seen” and as you will see in the videos, she was always wagging her tail so fast that it was a blur. Though her loss is devastating beyond words, I know how lucky I was to have her. She had a full life and I am grateful to my mom and God that we found each other, though I think our coming together was inevitable. The great philosopher and poet Rumi said, “Lovers don’t finally meet somewhere. They’re in each other all along.” Like the lovers of Rumi’s poetic saying, I think me and my little doggie soulmate were in each other all along. A note about the technical video quality: I apologize for the technical quality of the videos. Most were just made with my cell phone so I could share Gabby’s antics with my friends, and in most cases I was throwing a toy with one hand and holding the phone or camera with the other. I had no idea then I would ever be making a site like this, or I would have done a better job!